Thousand Oaks, CA—December 2018… Mitchell is proud to announce two new additions to its lineup of affordable high-quality guitars: the MD150SB double-cutaway solid-body electric, which sports a classic Sunburst finish, and the O120CEMB orchestra-sized acoustic-electric, with a high-gloss Metal Black finish. Whatever a player’s musical style, either instrument offers outstanding tone, generous features, and premium materials. 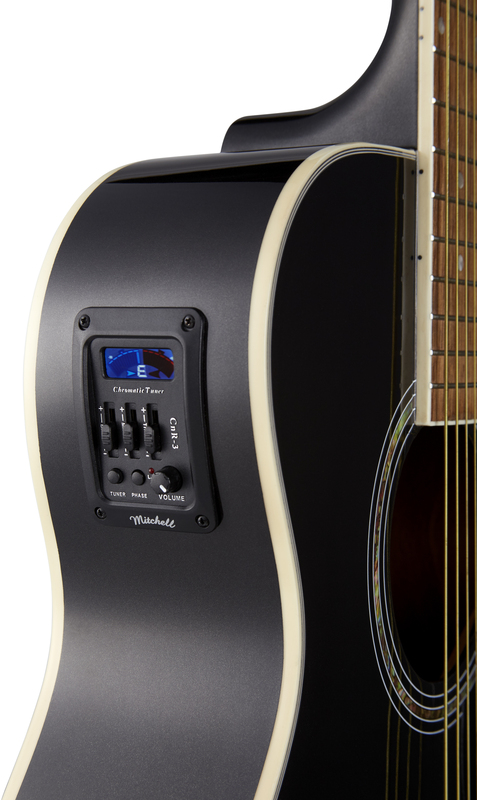 The Mitchell MD150SB is a highly versatile electric for beginning a rock ’n’ roll journey. Its Sunburst finish evokes the look of classic rock supergroups, and the double-cutaway form factor gives the player easy access to higher frets for advanced solo work. A one-piece maple neck is finished with a durable, jatoba cherry fretboard. The flatter overall neck radius makes the MD150SB easy to play. The adjustable TOM-style bridge is the industry standard for stable intonation, while the string-through-body design offers extended sustain. The MD150SB’s dual-pickup configuration employs high-gain ceramic humbuckers, a three-position pickup switch, a volume control for each pickup, and a tone control. This allows the player to achieve a variety of tones suitable for rock, metal, blues, jazz, and many other styles. High-ratio tuners ensure precise tuning control, and black nickel machine heads and other hardware complement the Sunburst finish beautifully. Packing a surprisingly big acoustic sound, the Mitchell O120CEMB is ideal for musicians who have found larger acoustic-electric guitars uncomfortable to play, as well as for those who simply want to expand their sonic palette. With a select spruce top, rosewood bridge, and mahogany neck, sides, and back, the orchestra-style size acoustic-electric is remarkably loud, even when played without amplification. Sealed die-cast tuners ensure tuning stability. The O120CEMB’s onboard preamp features top-grade electronics including a three-band EQ and phase switch for tailoring the amplified tone to the room or gig. The electronics section also features a built-in digital tuner, allowing for convenient and precise tuning on the fly. Its Metal Black finish, multi-ply body binding, abalone sound-hole rosette, and beautifully bound fingerboard add up to a head-turning appearance that will make an impression even before a single note is played. The Mitchell MD150SB and O120CEMB are available at Guitar Center and Musician’s Friend for $129.99 and $149.99, respectively. Before delivery to dealers, all Mitchell electric guitars receive a complete setup and quality control inspection to ensure exceptional playability. With a variety of models that deliver high-end quality and outstanding performance for a surprisingly affordable price, there’s a Mitchell electric guitar or bass for everyone. See more details online at www.mitchellguitars.com.